Making a custom breadboard for the Wemos D1 Mini. The Wemos D1 mini is a great development board for the ESP8266 Wifi microcontroller. (For more details, see my post IoT for Absolute Beginners). The main drawback of the D1 Mini over other development boards is that it comes with the pins separate and you must solder them in yourself. You can do this with the small breadboards designed to mount on a lego-like base-board. (But note, this board while it resembles Lego has a smaller bump pitch, and does not work with Lego bricks). You can find links to a supplier of the parts on this post. I have designed and made this custom baseboard on a CNC mill. You will need two of the 5x11 breadboards, and this gives you four usable columns instead of one. I made my sled by milling the outline with a 2mm endmill, drilling the locating holes with a 4mm drill, and drilling the corner fixing holes with a 3mm drill. The G-code and OpenSCAD files are here. If you use my G-code, you will need to start out with a 2mm endmill, then change to a 4mm drill then a 3mm drill at the tool change points. If you use the OpenSCAD file, you can import it into your CNC software and cut the whole board with one tool. Cut a piece of board 60mm x 40mm. I used white acrylic. Drill 4mm dia holes spaced 10mm apart vertically, and 32.5mm apart horizontally. That is each breadboard needs two holes 10mm apart, and the pairs of holes are placed 32.5mm apart measuring center-to-center. 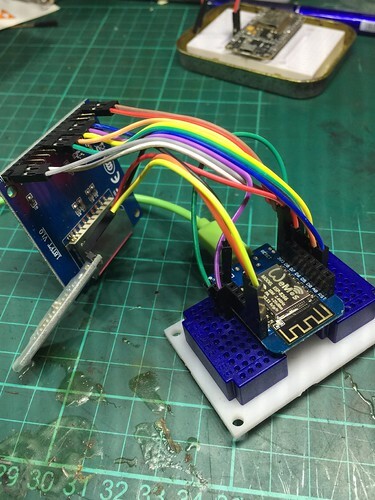 On a previous post Somchai asked how to hook up an ST7735 LCD screen to his WeMos D1 Mini and use it with the NodeMCU firmware. The NodeMCU platform (and compatibles like the WeMos) are a great way to get started in the Internet of Things. See my Introductory Article for how to get started in IoT with NodeMCU. 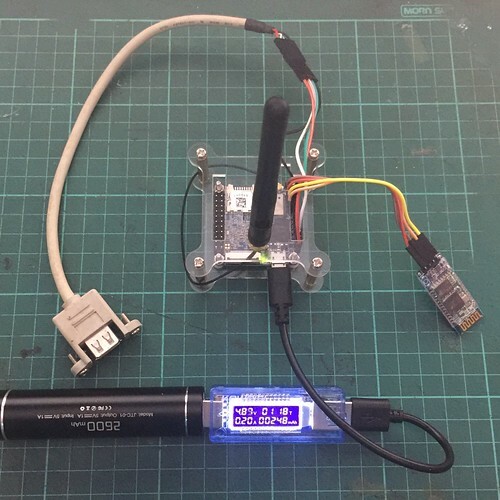 Here's how to connect and use this inexpensive LCD screen:. From your du Pont cable set peel off nine male-to-female cables, I suggest brown,red,orange,yellow,green,blue,purple,white,brown (these are contiguous in my set). And when booted it shows the modules present. 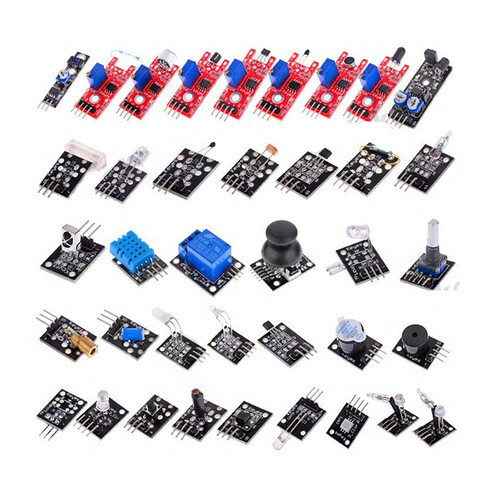 You must have SPI, ucg and bit modules, the others are up to you. 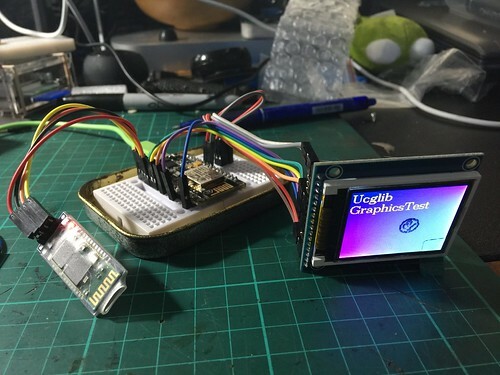 To test your screen, upload all the files from the NodeMCU ucglib example directory. You can use the GUI ESPlorer tool or the command-line NodeMCU-uploader tool to copy the files. It happens that the GraphicsTest.lua file defaults to using using the ST7735 screen. If you have a different supported screen, make sure that you select that screen when you build your firmware, and that you edit GraphicsTest.lua to call the setup routine for your screen. In your own code, I've found you can connect blue (reset) to the NodeMCU reset and save a pin. 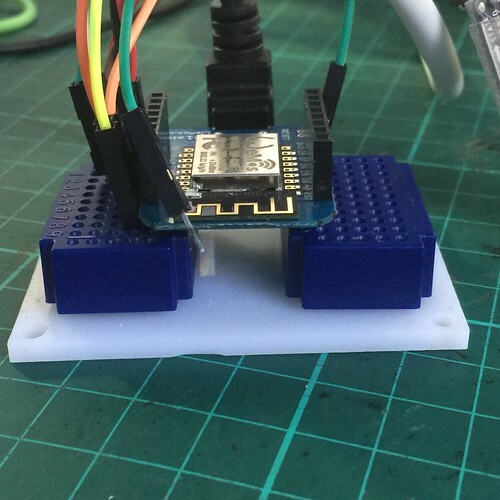 This article explains how to use a Bluetooth-to-Serial module to allow you to work with the Arduino and ESP8266 microcontrollers without needing a direct USB connection. Using Bluetooth saves a lot of wear and tear on your USB ports, and eliminates the risk of damaging your computer if you make a wiring mistake. 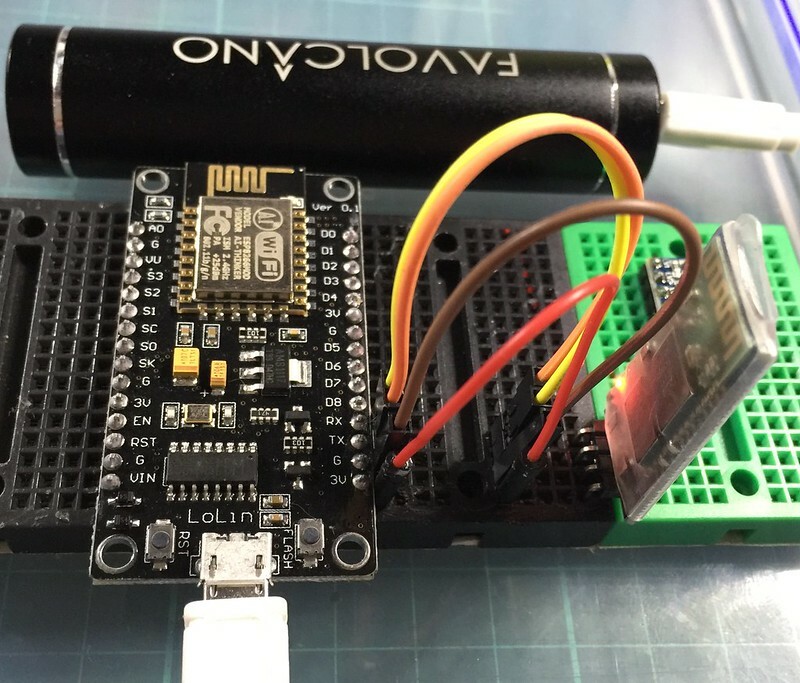 In a previous article I talked about getting started with the NodeMCU platform, which is a programming environment for the ESP8266 WiFi microcontroller. If you use the "NodeMCU Development Kit" reference board, you get the ESP8266 module itself, plus a USB interface that you can use to power the board, and also to download your code to it. The popular Arduino physical computing platform also has built in USB. However if, like me, you use an ultralight laptop computer with a limited number of USB ports, it might be more convenient to use a Bluetooth interface to download code from your PC. This also has the advantage that there is literally no way that any mistake you make in your experimental circuits could damage your PC. 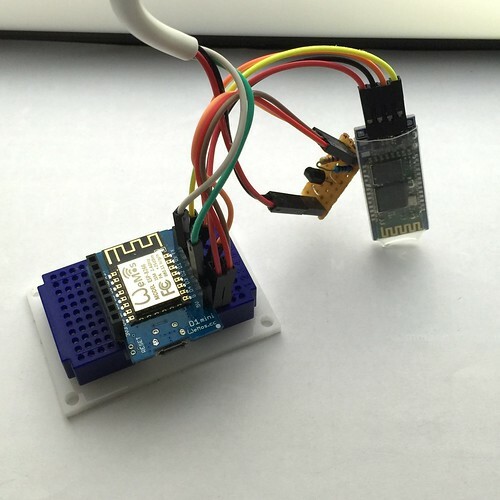 The ESP8266 doesn't have Bluetooth built in, but it is easy to add Bluetooth by using a Bluetooth-to-serial module. The "HC-06" module is available for about $4 from many vendors, such as here. 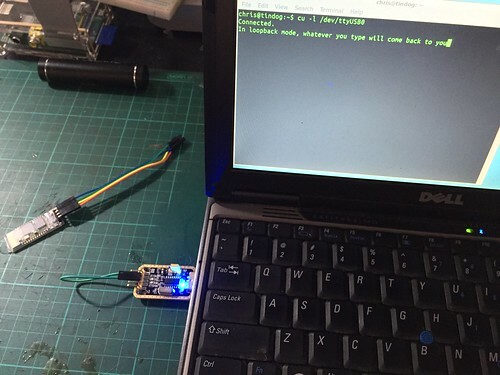 This module acts as a bluetooth character device, and once you have paired with it, you can use it just like any other serial port, using the same tools you would use to download your programs over USB. You can think of the HC-06 module as a dual interface bridging device. Anything received wireslessly on the Bluetooth side is transmitted as asynchronous serial via the wired interface. Anything received on the wired serial side is transmitted via the wireless bluetooth interface. 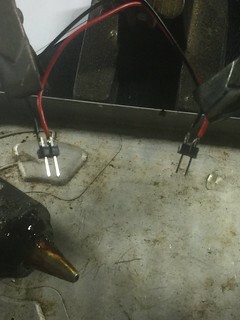 Once the device is connected it is "transparent", that is the device simply relays whatever it receives without changing it. Out of the box the HC-06 module answers to the name 'linvor', and operates at 9600 bits per second (bps). Arduino and ESP8266 typically work at 115200 bps, so we need to reprogram the HC-06 to work at this speed. 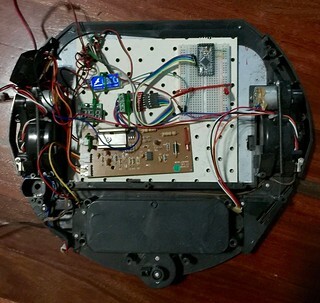 To do this, we must connect to the serial interface on the HC-06 and send some commands. If your application works at 9600, and you are happy with the default device name, you can skip this section. 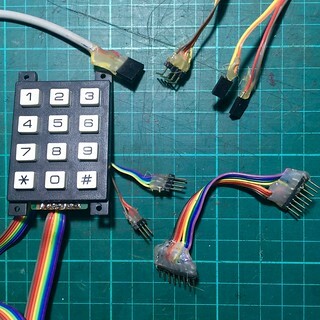 To reprogram the HC-06 you will need a 5-volt serial port. The easiest way to get this is to buy or borrow a USB-to-serial adapter. This module is one I prefer, as it is switchable between 5v and 3.3v for the serial signalling voltage. Mac users might prefer this device which uses a USB chip from FTDI, as I have found the drivers for this chip are well supported on Mac. Note that transmit and receive are "crossed over". If you think about it, it makes sense, whatever the USB adapter transmits, the bluetooth module must recieve. Once you have the physical connections made, it's time to connect to a PC and use a Serial Terminal program. If you have Windows, use Hyper Terminal, if you have Linux or Mac use "/usr/bin/cu". Note: The HC-06 module has a quirk, you must send an entire command in under around half a second, or the module will ignore the command. Don't try to type the commands, prepare them in a text editor, then paste each command into the terminal window one by one. AT+VERSION - Request the device to report its version. We do this only to confirm that the connection works. The HC-06 understands a limited number of "AT commands" which is a command scheme commonly used by analog modems. See this article if you want to know more about the commands that the module understands. To begin, we connect to the USB-serial adapter by running a program called 'cu' (which stands for 'Call Up' as it was originally used with serial-connected analog modems). On Linux this is as below. On Mac it will be /dev/tty.something depending on the model of USB adapter you have. Once you are connected, paste in the below commands one at a time. You will not see the text that you paste on screen, but you should see answers to the commands as shown in the screenshot below. To exit the cu program you must press the return, tilde (~) and period (.) keys in succession. Once you have completed the reprogramming, disconnect, and reconnect using 115200 bps. To test that the device is now working at 115200 bps, paste the version command again. You are now ready to pair the device, and are finished with the USB-to-serial adapter. If you cannot get the HC-06 to answer, confirm that your USB adapter is working. By connecting its transmit pin back to its own receive pin, you create a "loop back" situation, where anything the USB converter transmits, it also receives. Connect to the device and type some text. You should see it appear on screen. If you disconnect the wire and type some more, text should not appear. 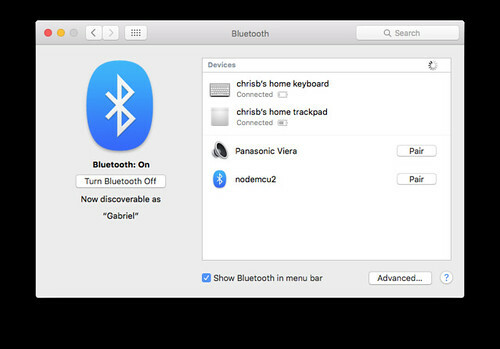 In order to have your computer present the HC-06 as a usable device, you must "Pair" the device using your computer's bluetooth settings. This is a one-time operation. You can pair an HC-06 with several computers if you need to. On a Mac, open the System Preferences app and select the bluetooth panel. Look for your HC-06 to appear in the "available devices" pane, and select "pair". Above: MacOs is searching for Bluetooth devices available to be paired. Here we have two devices already paired, and have discovered two unpaired devices. 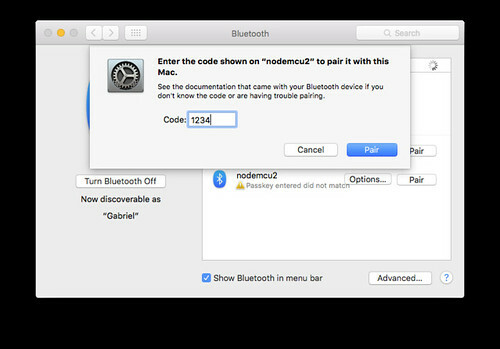 Note that the pairing will fail initially, because your Mac does not know the PIN for the HC-06. The default pin for HC-06 is "1234". Select "Options" and enter the correct PIN. Above: Entering the pairing code for a HC-06 module. The default code is '1234' (which is the same code I have on my luggage). Once your device is paired, it will appear as a file in the /dev/directory, eg. my device is /dev/tty.nodemcu2-DevB. Above: Successful pairing of a HC-06 bluetooth module. On Linux or Windows your bluetooth device will be /dev/ttySomething or COMsomething: respectively. 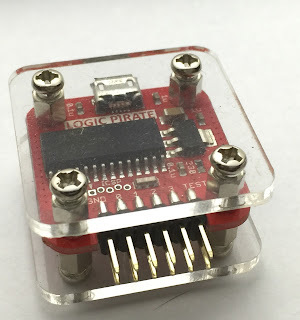 Now that you have a paired HC-06 you can connect to it like you would any other serial port (such as the USB-to-serial adapter we used above). When using an IDE to interact with NodeMCU devices, your bluetooth serial port should now appear in the menu of available serial ports. 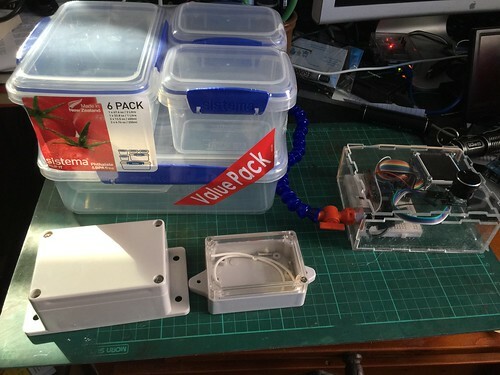 If you have been wanting to get into the Internet of Things (IoT) but are not sure where to start, or you are enthusiastic about IoT and want to bring others into the field, I am going to describe how to get started with some easy-to-use hardware and software for as little as $20. 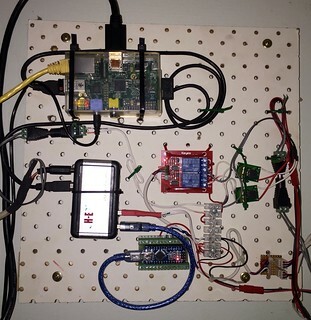 Above: a sophisticated IoT project still using only 4 components costing under $20. This article is is targeted at those who have some knowledge of computer programming (at least that it exists) but little or no experience with digital electronics. I aim to introduce you to the tools that you will need and allow you to get started experimenting with The Internet Of Things. school, this should be all you need to get your teams started. You're probably reading this on a computer that consists of a central processor, some memory chips, some file storage (magnetic drive or more memory chips), a keyboard or touch-panel, and an LCD screen. These items are the basics of all computing: processing, volatile (temporary) storage, nonvolatile storage, input devices and output devices. IoT devices are just the same, except everything is much smaller; they are typically powered by a microcontroller which is a term for devices that combine all the traditional parts of a computer onto a single chip (or an integrated multi-chip module). I am going to talk about the middle class of 32-bit microcontroller devices in this article. At the low-end, the Arduino and similar are excellent but are not powerful enough to connect to the internet on their own. At the high end, there's a place for the more powerful and expensive devices, but I'll talk about how I use those boards another time. For processing you have a processor that runs between 1 and 100 million instructions per second (MIPS). For memory, you typically have a frustratingly small amount of RAM, from 1kB to a few hundred kB. For file storage, you have somewhere from 8k to a few megabytes of FLASH memory. For input and output you have from two to twenty digital "pins", and some communication interfaces such as Asynchronous serial, Inter-IC communications Bus (I2C), Bluetooth, or WiFi. Under the control of your programs, the IO pins can be used singly or in groups to control buttons, lights, sensors and screens. A modern 32-bit microcontroller is about as powerful as a home computer from the 1990s, but shrunk to the size of a postage stamp. These devices can be programmed in assembly language or low-level languages such as C and C++, but I won't go into those here. Beginners will be much more comfortable with higher-level languages such as Lua and Python. To develop program code for a microcontroller you write your programs on a normal sized computer and then "upload" the program to the microcontroller. This can be done with a wired connection or sometimes over wireless links. 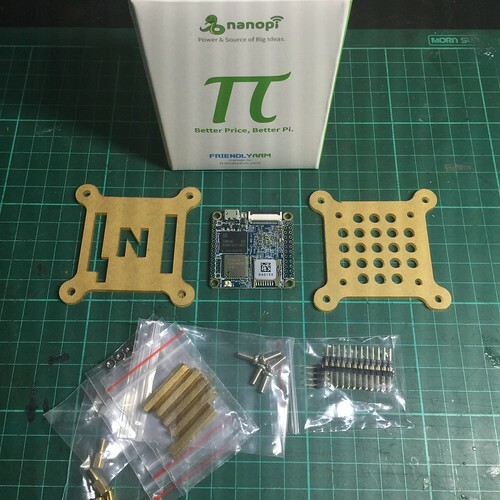 For the rest of this article I am going to talk about one particular combination of hardware and software that I think makes an economical and beginner-friendly platform for IoT experimentation, the NodeMCU platform. 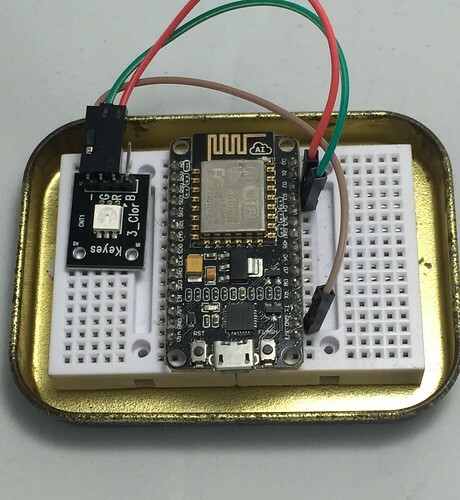 The ESP8266 is a tiny microcontroller chip invented by Espressif in China. It is intended for very low cost smart devices such as internet controlled light bulbs and power switches. 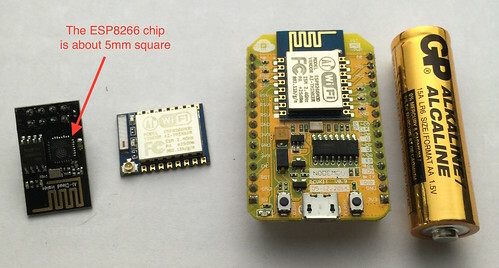 There are a number of "compute modules" that combine the ESP8266 chip with some flash memory and power components to provide a postage-stamp-sized module that can be incorporated into larger circuits. Sometimes these modules are then mounted on a carrier board which adds more power circuitry and some switches. 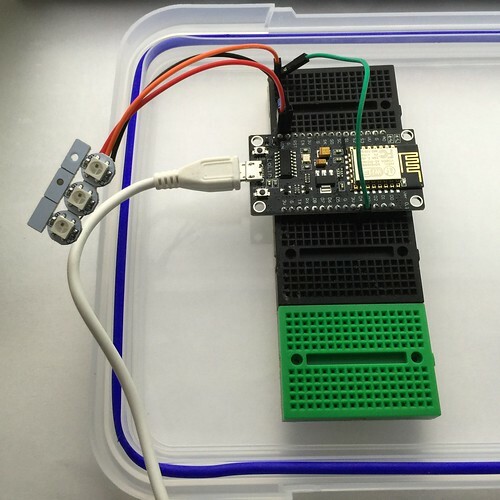 One of the most beginner-friendly is the reference design from the NodeMCU project. 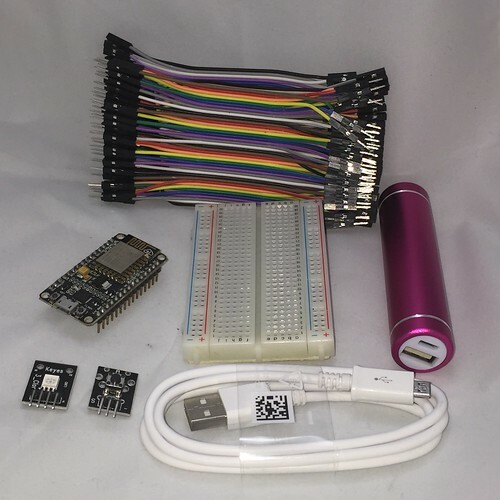 The "NodeMCU Developers Kit" (DevKit) is an open-source design that is available from a number of manufacturers for under $5 (more about this below). 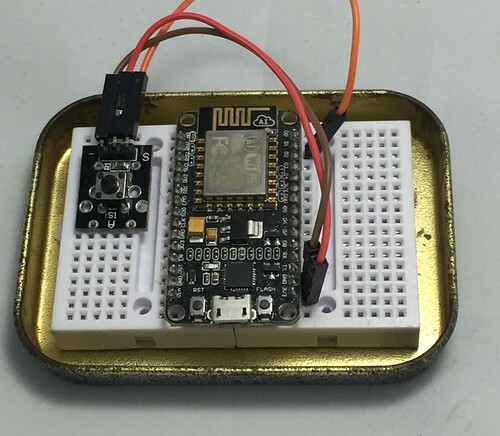 The NodeMCU project provides a firmware distribution for the ESP8266 modules. The term "firmware" is used to describe software that you program into hardware just once (get it? It's in between hardware and software. Engineers didn't get out much before computers became cool). You can think of the NodeMCU firmware as a very simple operating system for the module environment; you combine the standard firmware with your custom-written application software to solve some particular problem. The NodeMCU firmware is written in C, but provides an environment for you to upload and run application programs written in Lua (an easy to learn scripting language). So all the hard C programming has been done, meaning you (the beginning IoT programmer) can work in the much more friendly Lua language. 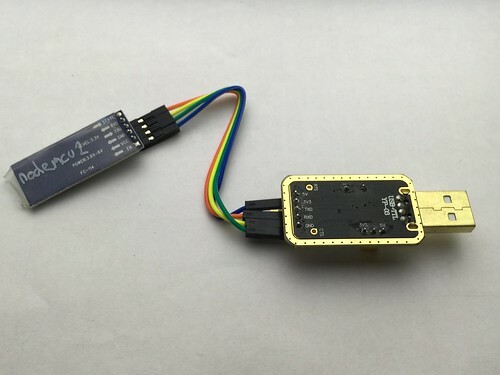 To use NodeMCU, you must install the NodeMCU firmware on your device just once, after that you can simply uload programs written in Lua into the device's flash memory over a USB cable, to make the device do whatever is desired. The NodeMCU project also provides the reference hardware design for their Development Kit board, which is ideal for running the firmware, but the firmware itself will run on almost any ESP8266 module, not just the ones based on the reference design. The WeMos D1 and D1 Mini boards are another design that is ideal for use with NodeMCU. The NodeMCU development kit board gives you around 10 general purpose IO pins, WiFi wireless ethernet, asynchronous serial port, plus a USB socket for power and for uploading software to the device. Other ESP8266 modules may have more or fewer IO pins. You can add bluetooth if desired by connecting a bluetooth module to the asynchronous serial pins. You can also store files in whatever whatever space in your module's flash memory is left-over after the firmware and your application software are uploaded. The NodeMCU DevKit board has 4MB of flash memory, of which around 3MB remains available after installing the firmware. The NodeMCU DevKit board has a blue light-emitting-diode (LED) connected to pin D4, and a push button (labelled "Flash") connected to pin D3, so if you want to dip your toe into IoT for the least amount of money, you could buy the DevKit board and nothing else, powering it by USB cable from your computer or from a spare USB charger. 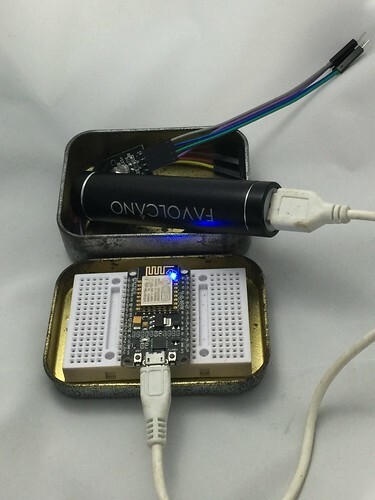 Above: The NodeMCU DevKit reference design is small enough to fit into the lid of a mint tin, but powerful enough to connect to the Internet. NodeMCU has some example code on their website, and there is a comprehensive documentation site for the NodeMCU Lua programming environment. I'll be posting my example projects here soon, also. There are a number of software IDEs (Integrated Development Environments) available for editing and uploading Lua code. The quality of IDEs in the embedded world might be a little less than for mainstream computers, however I have found the ESPlorer application is serviceable, if a little quirky. It's compatible with Mac, Windows and Linux. Most ESP modules ship with a firmware that is intended to work as a "WiFi Modem" (the so-called AT Firmware). The first thing you'll need to do is wipe this and install the NodeMCU firmware by following these instructions. You can obtain the latest NodeMCU firmware from this service. I recommend you start with the default modules plus HTTP, I2C, MQTT, PWM and SPI. If you buy an LCD screen add the UCG module. 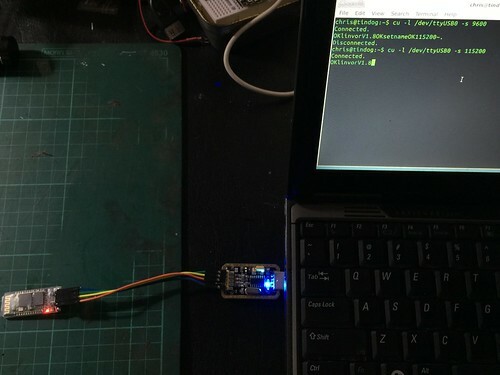 Use a USB-to-Serial converter between your PC's USB port and the NodeMCU board's asynchronous serial interface. 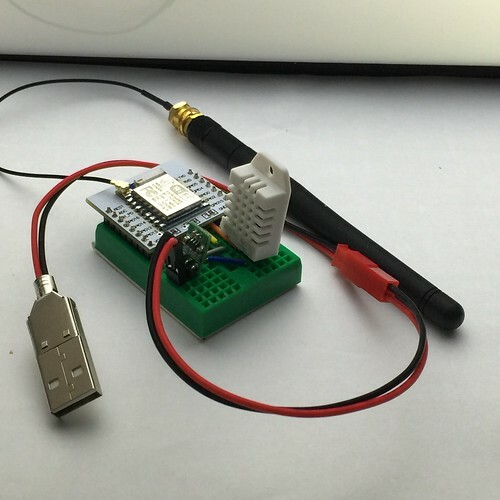 The NodeMCU DevKit has a built-in USB converter, so you just need a USB cable. 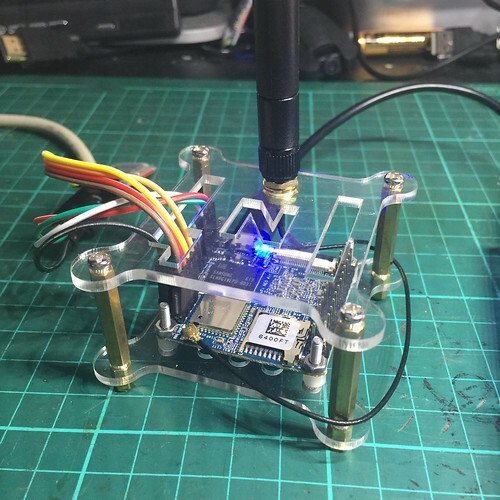 Connect a Bluetooth-to-Serial module to the NodeMCU board's asynchronous serial interface, and pair the bluetooth module with your PC. Use one of the above methods to install a program on your board that lets you send further programs to it over WiFi. We'll cover the first two of these methods in the next article in this series. From the point of view of your PC, they are the same, except that in the first case you are connecting to a virtual serial port implemented by the USB converter, and in the second case you are connecting to a virtual serial port implemented by the bluetooth module. USB is slightly cheaper and easier to work with, but do consider Bluetooth if you have a Mac, especially those with limited USB type-A ports. The NodeMCU programming environment provides a number of library functions grouped into modules, and has programming modules that provide high level abstractions for many common input and output devices. 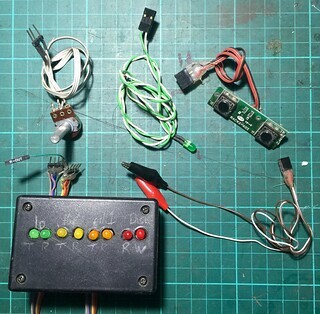 Where there is no high level abstraction, the low level GPIO module provides direct access to the input output pins and allows youto write your own programs to interface with almost anything. 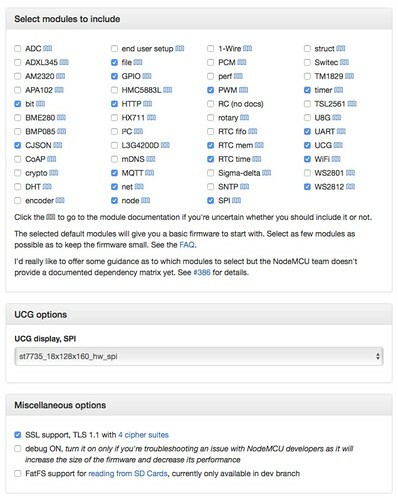 The NodeMCU firmware provides a number of core software modules to perform various tasks (such as read particular models of sensors, and control particular models of display), and there are even more modules availble as open source contributions that you can add to your base firmware. There are web services that will construct a new firmware image for you containing the set of modules that you select, or you may upload the NodeMCU source code, import some extra modules, and compile a firmware image that contains all the modules you desire. Computers do all their thinking with binary logic (ones and zeros), and represent binary logic in the physical world using voltage. A logical one is high voltage, a logical zero is no voltage. When a computer talks to another computer or a peripheral device, there's one or more wires which are either at high voltage or low voltage. That's basically all there is to it. Skip the rest of this section if you like. For a long time, most computers used 5 Volts as the standard high voltage. As computers became faster and used more power, the industry shifted toward 3.3 Volts as the standard voltage. Commercial electronic devices are made of components joined together using solder, which is an alloy of various metals that has the particular quality of melting at a relatively low temperature (around 200 degrees). (Don't panic, you will not need to do this.) In soldered circuits, components are placed in contact with other components, wires, or flat panel "circuit boards", and then joined permanently by flowing molten solder onto each electrical connection using a hand-held soldering iron or more complex tools. Once the molten solder cools and solidifies, components are permanently joined. The prospect of using molten metal to construct circuits is a bit daunting for beginners, so the good news is you can get a very long way indeed without needing to do any soldering. 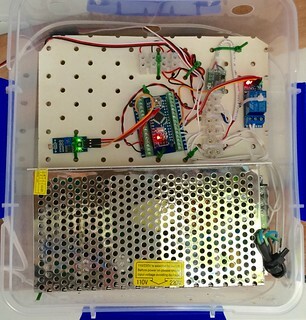 The projects I teach can be built without any use of a soldering-iron. 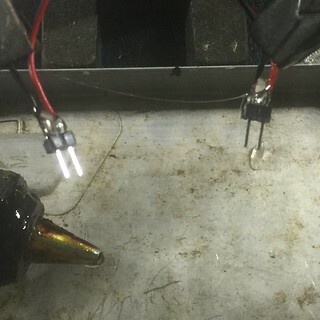 Soldering is an inexpensive, compact and robust way to permanently connect components, and should be considered once you have your design perfected and want to make lots of a particular circuit, but to start out we will use other techniques. The trade-off is that the things we make will be a little bit larger, and more delicate (they might come apart if you drop them). These boards have rows of spring-loaded sockets that are connected together electrically. A wire placed in a socket will be connected to the other sockets in the same row. 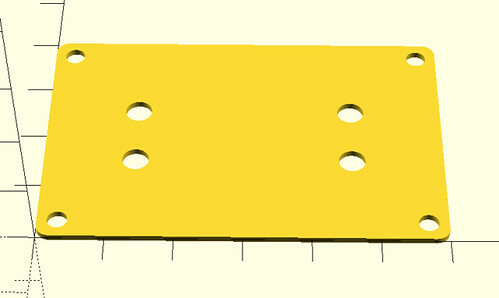 We'll use inexpensive pre-cut lengths of wire fitted at each end with either metal pins suitable for plugging into breadboards, or with sockets suitable for accepting pins. You can even cut your own jumpers from a roll if you use the right kind of wire. Above: various types of solderless breadboards, the smallest are repositionable on a Lego-like baseboard. Each socket is electrically connected to the other four sockets in the same row of five. Imagine the most cliched 1960s computer (as seen in old movies) that you can, the above techniques of modules and interconnecting wires are exactly the technologies that began the computer revolution. 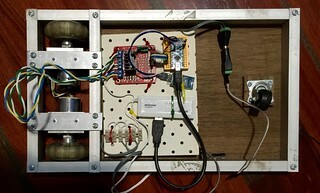 To recap, we will have a compute module, installed on a breadboard, and connected by jumper-wires to peripheral modules which might be on the same breadboard, on an adjacent board, or mounted on a panel. 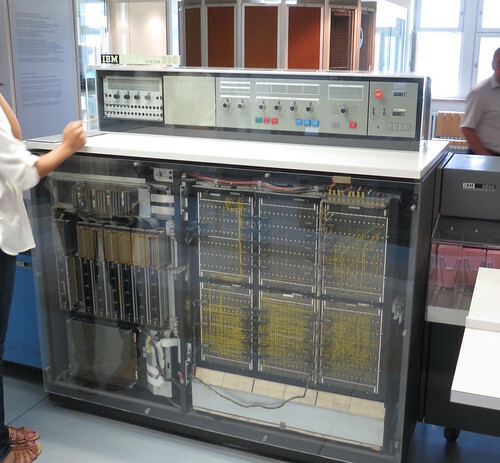 Above: Mid-1960s IBM computer component showing panel-mounted I/O and plug-board wiring. 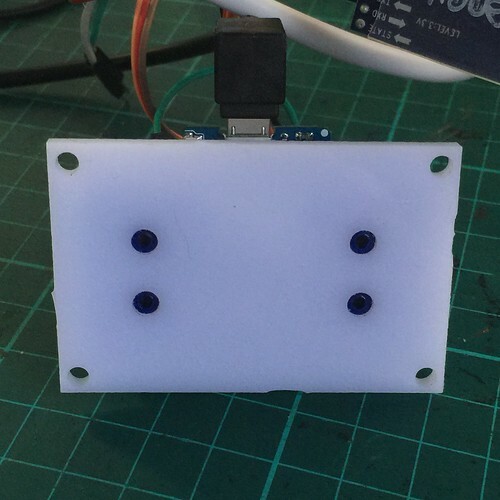 Above: NodeMCU DevKit board mounted on a solderless breadboard and connected to module consisting of three full-colour Light Emitting Diodes. On these breadboards, each socket is electrically connected to the other four sockets in its row. To control lights, or motor modules the gpio firmware-module can be used to set a pin to a high or low voltage using the gpio.write function. The pins on the ESP and most microcontrollers can act as either inputs ("reading" the voltage presented to the pin) or outputs ("writing" a voltage to the pin). We must set the mode of a pin with the gpio.mode function to use it as an output. Microcontrollers don't output very much power on their IO pins, typically only just enough to light up a small light-emitting-diode (LED), so if you are controlling higher powered devices like relays or motors, you will need to use a power boosting circuit. Generally modules for relays and motors include this boost circuit so can be connected directly to your output pins. If you configure a pin as input by calling gpio.mode then it does not output any voltage, instead any voltage applied from outside will be reported as a logical one or a zero when gpio.read is called. When the NodeMCU environment starts up, all the pins are in input mode unless you reconfigure them in your code. 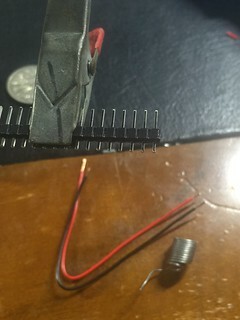 The simplest way to connect a switch is to have a switch between the pin and ground (zero volts) and to have other circuitry that presents high voltage when the switch is not pressed. The extra circuitry can be part of a switch module, or provided by the "internal pull up" circuit inside the microcontroller. Again, pre-built switch modules should include any extra circuitry that is needed. A digital input pin is going to convert whatever voltage it sees into one of two values. Typically anything from 0 Volts up to about half of the high level will read as a zero, and anything higher than that will read as a one. Some microcontrollers can read "analog" voltage where the actual voltage is reported as a number proportional to the voltage (say converting a voltage between zero and 3.3 volts into a number between 0 and 255). We'll stick to digital inputs only here. So far we have discussed only the simplest input and output, switches and lights are from the point-of-view of a microcontroller communicating only a single binary digit --- one 'bit' --- of information, something is either on or off. More complex information can be communicated in two ways: by using multiple pins, or by using one pin (or a few pins) as a serial communication bus. I2C (Inter Integrated-Circuit bus) uses two pins (a clock and a bi-directional data pin). This is often used to talk to sensors and simple displays. SPI (serial peripheral interface) uses one pin in each direction plus some clock signaling and device identification pins. It's often used to talk to graphical display modules, sensors and memory cards. OWB (One-wire bus) uses a single pin that acts as clock and bi-directional data; it's slow but cheap. A popular temperature sensor is the best known use. Most microcontrollers have hardware and software to communicate with several of these technologies. As long as you know which protocol a particular device module expects, you should be able to talk to it. 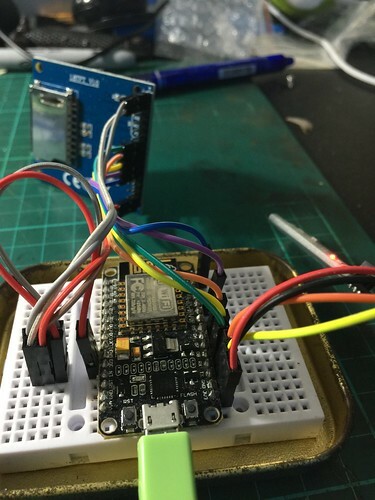 The good news is that the NodeMCU programming environment has built in firmware modules to talk to many different kinds of serial IO devices such as sensors, addressable strings of LEDs, and various kinds of displays. It also has lower level modules for each kind of serial bus, so that if you have a hardware module that is not directly supported you can write your own interfacing code. 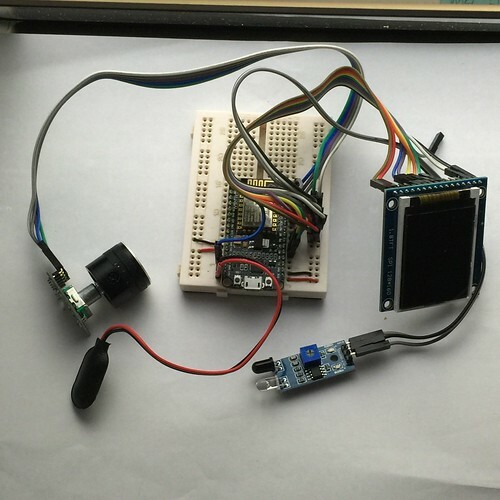 As an example, one could construct an adjustable thermostat consisting of a temperature and humidity sensor, a graphical liquid crystal display, a rotary dial switch and a push-button switch entirely using off-the-shelf modules supplied as part of the NodeMCU environment. 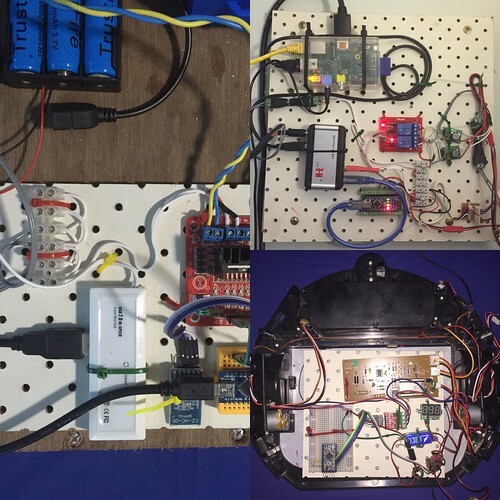 Above: A sophisticated but easy to assemble IoT project consisting of a rotary dial switch, an LCD Screen, and an InfraRed proximity detector. See Ideas below for some more project examples. Here is what to buy to get started. I will present three lists - A basic starter set, a comprehensive but inexpensive set of modules, and some stretch options. As I mentioned above, for the very budget-conscious, you can buy just the NodeMCU DevKit board itself and experiment with its on-board button and LED. The item listings below are at AliExpress.com which is a Chinese electronics and consumer goods bazaar. Sometimes items go out of stock or change price unexpectedly, I'm happy to advise if you are unsure about anything. CPU with wifi and USB interface. This has one light and one button built in. 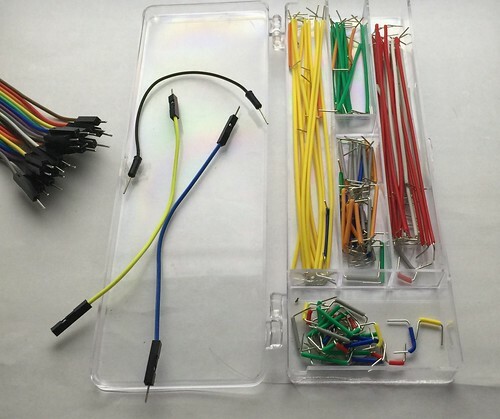 A basic set of multi coloured jumper wires can be peeled apart singly, or in twos and threes, as needed. 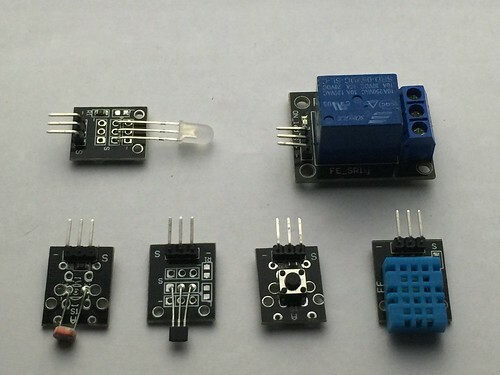 This module actually has three LEDs - one red, one green, one blue, in the same package. You can use just one colour, or mix colours. A rechargeable power bank is the best way to power your projects. 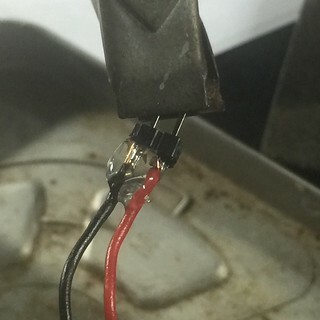 An old phone charger works too. Consider buying locally as some countries will not accept batteries by airmail. If you don't already have a micro-USB cable, they cost around one dollar. 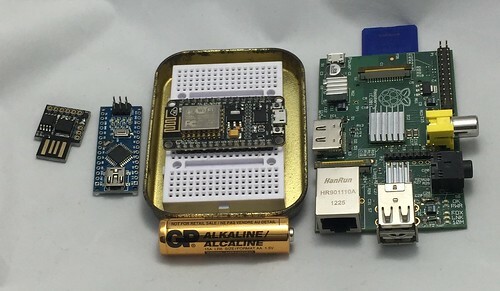 Above: all the items in the $12 basic IoT starter kit. If you are buying for a team hackathon, consider searching for the same item plus "10pcs" or "100pcs" you will often find bulk items at an even lower cost. So for around $20 total outlay you can be up and running with the ability to build many kinds of IoT projects. If you find plugging and unplugging USB to be annoying, or have an ultralight notebook with limited USB, you can use Bluetooth to upload to your board. You will need to buy or borrow a USB-to-Serial converter, below, to set up this module. I'll cover how to use this module in another post. 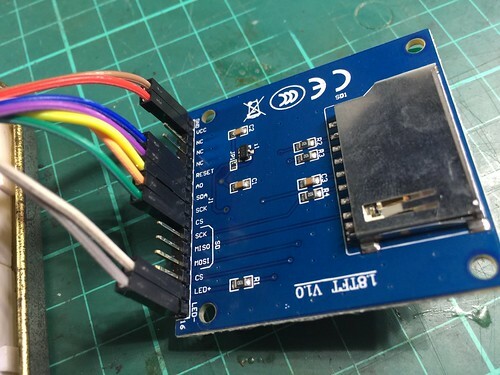 If you have trouble finding drivers for the USB chip built into your NodeMCU module, or if you are using an ESP board that lacks a built in USB interface, the FTDI USB-to-serial converter has the best supported drivers. Jumper cables are commonly available in 10cm, 20cm or 30cm lengths. While the shorter ones are most useful, a set of longer cables is handy to have. A small video screen lets you show text, graphics and menus. This screen uses the ST7735 chip that is supported by NodeMCU's ucg module. A larger LCD screen with touch panel, which can take the place of a whole lot of buttons. This screen uses the ILI9341 chip that is supported by NodeMCU's ucg module. 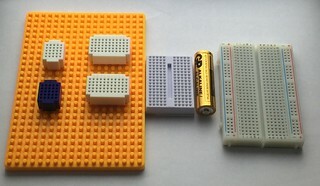 These small breadboards clip together or can be stuck to a surface. Handy for modules that are too wide for a single board. Above: suggestions for enclosing your projects. Answer the question "Oh, no, did I forget to close the front door?" Above: temperature and humidity sensor built on a small breadboard. Settle once-and-for-all whether Jane's office is really colder than Bob's! Above: NodeMCU module wired up to modules for combined dial/push switch, infrared object sensor and a small LCD screen. 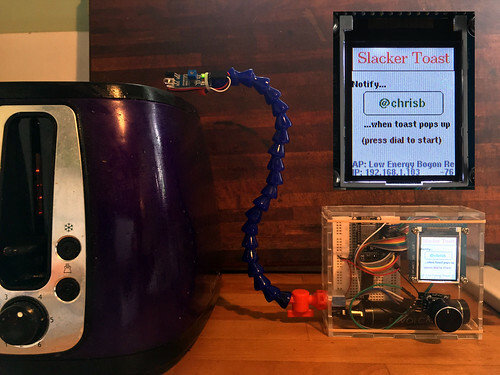 This project sends you a reminder alert when your toast is ready. Above: Wemos D1 module with bluetooth-to-serial converter and an interface board for controlling an illuminated pushbutton switch. Intended as a "team meeting alarm". Do you need to photograph a small item? 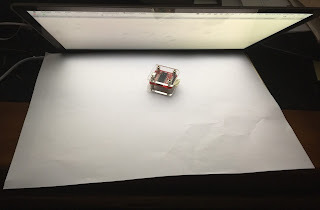 Couldn't be bothered setting up a studio soft-box? cable ties (also known as "Zip Ties"). a robust installation that will function reliably and look professional. cables to length and attach new ends. Next hold your headers in a soldering clamp, and tin each pin. them overlapped by 2mm and touching with the soldering iron. tempted to touch until it is cool. "SIL" is an acronym for Single-In-Line, and refers to the arrangement of connection pins in single row, which is best for working with solderless breadboards and/or Arduino. 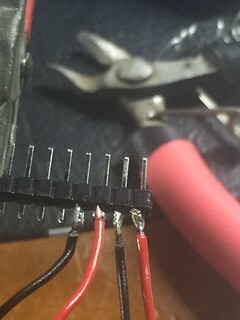 If you are working with breadboards, make up a number of cables that join a male header to various components such as switches, LEDs, speakers and batteries. When you want to test a module it's handy to have pre-wired inputs and outputs that you can re-use for temporary hook-ups. I have a boxful of these that I've made for various devices, and some of them have been reused over and over for many years. When your installation consists of a number of modules connected by jumper cables, an excellent way to make the lash-up installable is to cut a piece of peg-board to size and fix each module in place with cable-ties. Don't forget, the self-adhesive backing on most breadboards is there to be used, too. 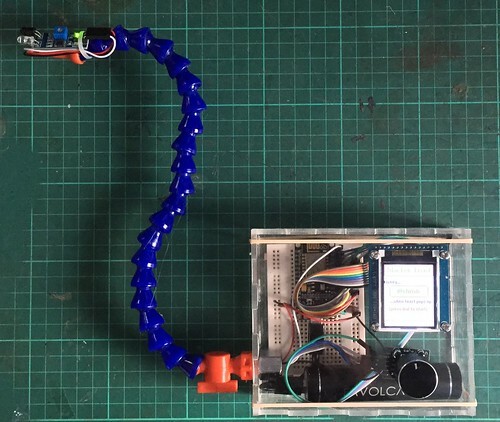 I use this pegboard technique for home automation equipment points, and for larger robots.